One UCF researcher may be on the brink of bringing 3-D- TV back from the dead. His work is so far along that the National Science Foundation has given him a $400,000 grant over five years to develop the materials needed to produce display screens. When 3-D TVs first came on the market in 2010, there was a lot of hype and the market expected the new sets would take off. Several broadcasters even pledged to create special channels for 3-D programming, such as ESPN and the BBC. But in the past year, those broadcasters have canceled plans because sales have lagged and the general public hasn’t adopted the sets as hoped. Some say that’s because the television sets are expensive and require bulky equipment and glasses. Thomas’ approach would use new plastic composites made with nanotechnology to make the 3-D image recording process multitudes faster than currently possible. This would eliminate the need for glasses. Thomas and his colleagues have developed the specific plastic composite needed to create the display screens necessary for effectively showing the 3-D images. That work has been published in the journals Nature and Advanced Materials. Thomas has joint appointments in the UCF NanoScience Technology Center, the Center for Research and Education in Optics and Lasers (CREOL) and the College of Engineering and Computer Science. 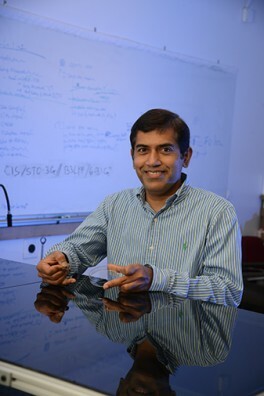 The NSF CAREER Award is the agency’s most prestigious award for junior faculty.